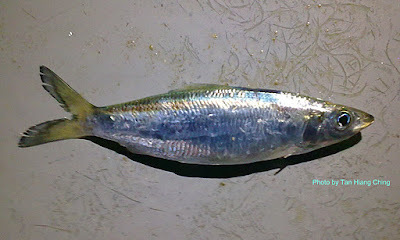 Rainbow sardines and round herrings are common name for the members of the Dussumieriidae family. They differ from Clupeidae in having a single pelvic scute. Rainbow sardines and round herrings are found in the Pacific, Atlantic and Indian seas. They are typically marine. Most of them inhabit shallow coastal waters and estuaries. They are schooling fishes that feed on small planktonic animals, particularly crustaceans. There are 2 genera and about 9 species of Dussumieriidae worldwide. Malaysia has a single genus and about 2 species.